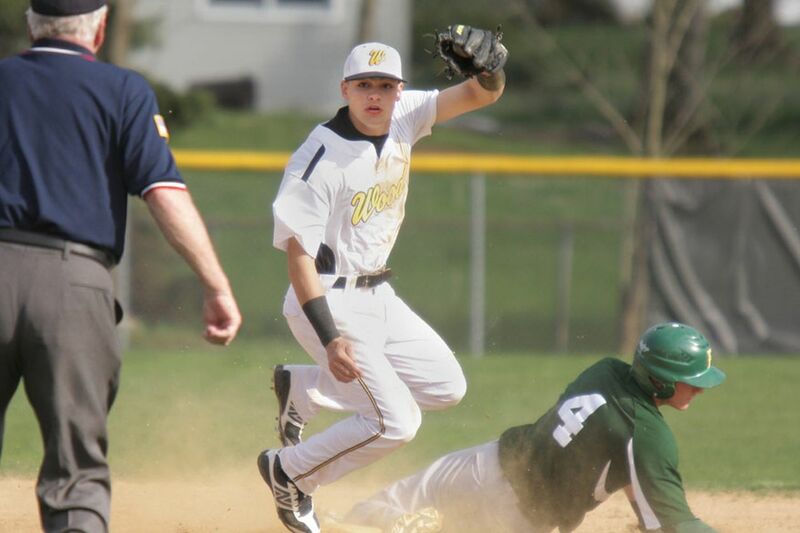 Antonio Rossillo hit a grand slam with two outs in the top of the seventh to help the Archbishop Wood baseball team edge Pennsbury, 11-9, on Saturday. He went 2-for-5 with two runs and four RBIs. Bob Hennessey hit a triple. Luke Cantwell and Jim Murphy added doubles. Ben Karnavas went 3-for-3 with a double, two RBIs and two runs as Radnor beat Conestoga, 8-5. George Hoysgaard hit a double and Sean Mullarkey scored two runs. Jimmy Sweet picked up his first varsity win. Penncrest lost to Calvert Hall, 11-1, despite Brett Bonebrake’s inside-the-park home run. Max Perry had a triple and went 5-for-5 to lead Springfield (Montco) past Germantown Friends, 13-10. Tyler Borowieck had two doubles, and Nathan Dennis and Ryan Deal each added one. Jeff Decker hit a triple and had one RBI in Germantown Academy’s 7-4 victory over Conwell-Egan. Matt Brittingham earned the win with three strikeouts. He also had two RBIs. GA is now 4-3 overall. Max Hitman, Jack Tulskie and Tyler Kehoe each had two RBIs apiece to help Archbishop Carroll down the Haverford School, 8-2. Anastasia Lewis recorded 14 strikeouts as Penn Charter defeated the Hun School, 9-2. Abby Manion and Luc Regalbuto each hit two doubles and had three RBIs. Abbie Quinn had a homer and three RBIs. Conestoga fell to Manheim Central, 11-6, as Max Austin and Scott Smith scored two goals apiece. Will Bryan and Brendan Murphy each added one goal. Ben Schall, Brian Stewart, Michael Stewart and Leo Wackerman each recorded two goals in Harriton’s 9-5 victory over Methacton. Cooper Gutsche tallied one goal. Allie Schwab notched four goals and four assists to lead Harriton past Central Bucks East, 17-5. Lucy Dwyer, Maddie Henderon and Katelin Williams scored four goals apiece. Alex Turner had seven saves. Randi Hess scored five goals to help Souderton beat Springfield (Montco), 15-10. Riley McGowan and Lauren Kenah each scored three goals. Caroline Kelly added two goals.